This problem basically asks you to calculate the factorial of a number up to 100. Now, I guess most of you know what a “factorial” is. For those who don’t, the factorial of a number N is 1*2*…*N. This problem would be very simple, had it not been for the maximum value of N. The structure of the problem is such that it asks the user to take the number of test cases as the first input. Then ‘t’ integers follow where ‘t’ is the number of test cases which was given as input previously. For every integer here, we have to calculate the factorial. This is very simple in languages like python or java which have built-in support for big integer types. It proves to be a hassle for people using C / C++ or languages that do not have a built-in biginteger type. Let’s think about how we can store the the result. for factorial) has over 150 decimal digits. The data types mentioned earlier can store numbers having at most 9 and 19 decimal digits respectively. So, we need to find a way to store the 150+ digits that we will get as the answer. The simplest data structure that we can use is an integer array of size of about 200 to be on the safe side. The least significant digit is stored in the lowest index 0. The next one in index 1 and so on. Along with the array, we need an integer specifying the total number of digits in the array at the given moment. Let this number be ‘m‘. Initially, a will be 1 and the value of ‘m‘ will be 1 specifying that we have just one digit in the array. Let’s take a simple example first. Consider that the array has some value like 45 and we need to multiply it with a value 37. This can be done in the following way. and the value of m will be 2 specifying that there are 2 digits in the array currently. Now, to multiply this array with the value 37. We start off from the index 0 of the array to index 1. At every iteration, we calculate 37 * a[index]. We also maintain a temporary variable called temp which is initialized to 0. Now, at every step, we calculate x = a[index] * 37 + temp. The new value of a[index] will be x % 10 and the new value of temp will be temp / 10. We are simply carrying out multiplication the way it is carried out usually. So, for the current situation, the iterations will be something like this. x = a[index] * 37 + temp = 5 * 37 + 0 = 185.
x = a[index] * 37 + temp = 4 * 37 + 18 = 166. Voila, we have the answer to 45 * 37 in our array with the Least significant digit in the 0th position. the answer and the value of m will be the number of digits in the answer. We can then just print the array from the Most significant digit to the least for the answer. Carry out multiplication of the array with 'i' as shown above. Print the contents of the array starting from the most significant digit and ending with the least significant digit. I suppose double will make you lose the precision, wouldn’t it? This is supposed to be easier in java because java lets you use java.math.BigInteger and calculations using BigInteger are reasonably fast. first number is 001 … each multiplied with 99 using the above method would give the storage as 0099.
is it not a wrong way of programming? Please tell me why it is giving wrong answer while submitting. I have check each and every test cases. Please tell me, what is the wrong in this program and how the way is wrong. I am new in the programming.. So please help me. Why it is giving wrong output result while submitting the solution. Dear Rohit, Kindly post your question on discuss.code.chef.com. We also will request you to avoid posting code in the comment section of blog. you said it is simple in java but i tried it not working for 100! Hey, Kindly post your query on our discussion forum http://discuss.codechef.com/. You will get suitable reply to your question. Hi Ankit, can you post your query in detail on our discussion forum http://discuss.codechef.com/. The reason why codechef judge is giving a wrong answer to the case when using double is because double returns a number with say 6 places to decimal multiplied with 10 raised to the power x(say). The question on the other hand demands an exact answer to 100!. Wouldn’t the temp be temp=x/10? In the language explanation just before the iterations it is written that “the new value of temp will be temp / 10″ Please correct the error. but if i use the %.0lf then it would give the exact ans.. then what is the problem in that thing..
why is it wrong if i store the factorial value in a unsigned double variable adn display using set precision…..i’m getting the expected output but its showing wrong answer in codechef.. I did the same thing. Works like a charm on my PC even for 200!, but CodeChef isn’t accepting it. because unsigned double wont be able to hold d result of 100! which is the limit given in the question. ya it’s x..i guess just slinty mistake..
sir it holds the result of 100! why this is giving wrong answer ? When we get 0099 (9900) in storage (array), we have to multiply it by 98 next, so we will keep 98 in an integer variable and 0099 in the array only. This method stores one of the two multiplicands in an array and the other in an integer variable, so we’ll keep the bigger one in the array and smaller one in integer variable. I am getting wrong answer on codechef but it is working fine on ideone till 100 factorial at least.Plz help. We can use long double then.I used long double and My program is working on ideone but not accepted on codechef.I don’t know what to do. Doubles are just approximations of real numbers and not exact. So, when you will see a list of factorials till 100 ! and compare your results, they will differ by a little amount. That is why, Code chef won’t accept. You need to use integers only. What is wrong with the below code? Codechef shows wrong answer. cant we simply declare the factorial as a double ? what is wrong with my code? why is codechef giving me wrong answer whereas my pc is giving the correct result. I tried a biginteger implementation in c++ but is unable to submit it. I dont know why it is not submitting. what is the problem in this code? 100! is nearly 10^157 .so such big number can not be handled with even long data type .so an array can be used in this case. Because 100! is so large it cannot be stored in any data type available in C++. Why is this giving a wrong answer? What;s wrong in this code? I dont know whats wrong with this code. But codechef showing it wrong for the small factorial. codes are changed in this. it says wrong answer, can anyone explain where is it wrong ?? my answer is wrong ,i cant find the mistake ,someone tell the mistake. Can any1 plz tell me why my answer is wrong? The maximum value an int can store is ~ 2 x 10^9. which is not enough if you want to store factorial of 100.
can u suggest us a way to overcome this problem. i am getting an error when it runs fine on my compiler. That is what this article is about, overcoming primitive data type restrictions of languages such as C/C++ using an array. why didn’t you just use Recursion of a function to calculate factorials ? 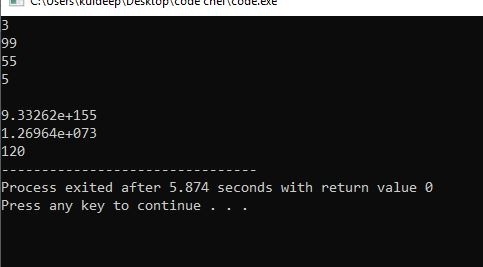 The code that i have written run correctly.This problem is very nice to solve.Thank you code chef.If any of you have any doubt just ask me. Can we divide/modulo very large numbers using this method? If so, how? Sir, my code gives correct output but u r website says wrong answer. plz correct me. int cannot store all the numbers. It has a range of -2,147,483,648 to 2,147,483,647, and hence it won’t store any number that lies outside this range. So when you are calculating factorial, you int s wont be able to store the values above a particular number and the program will give an error or the data will be distorted. This may be the problem you are getting when trying to submit. for factorial) has over 150 decimal digits. why is this code not working here? loop hole: what if x=199 then A[index]=9 and t is already having 1 or more higher value? But why can’t we use recursive approach ? It will be much faster and easier to understand. Sir this is my code and I am not able to find out my mistake so please help! what is wrong with this code?? Please identify what’s the problem in the code it is working well in my ide,Kindly go through it. give me a valid reason why my code is not correct. this website correct / resolve your code or not? whats wrong in my code pls tell?? ?